Happy 2014, y’all! You may have seen Rooster Illusion’s New Year’s Resolutions, promising lots of awesome changes, including merchandise, decent author bios, and maybe (just maybe) ten times the posts. Well, we don’t like to dillydally, so we’re getting started ASAP. I know this article isn’t getting posted until January 5th, which may not seem that quick, but I assure you I am writing it now as early as the second. Not the first, though, because… well… meh, you don’t need to hear that story. 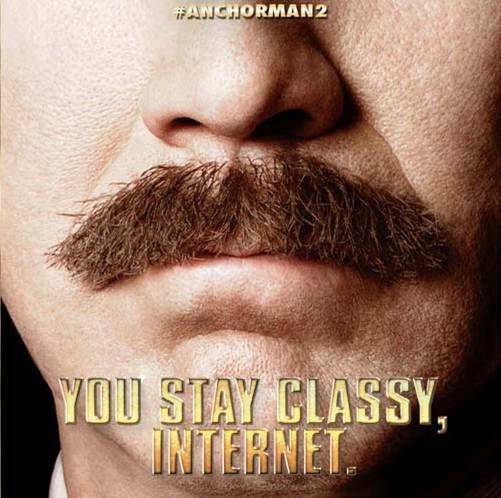 The Plot: Ron Burgundy (Will Ferrell) is at the top of his career, a successful daily anchorman in New York City. Everything’s really comin’ up Milhouse until he gets fired and his wife (Christina Applegate) is given the promotion he’s always dreamed of. Distraught and feeling betrayed, Ron sets out to live the destitute life of an alcoholic, unemployed news anchor for a little while. One day, when he’s about ready to give up, opportunity strikes and he’s asked to anchor for a new network, one that strives to deliver news 24/7. Assembling his old team Brick (Steve Carell), Brian (Paul Rudd), and Champ (David Koechner), he takes up this new job only to discover that he’s slotted the 2 AM graveyard shift. In order to raise viewership, Ron and his team essentially invent fluff news. Hilarity ensues. And mustaches. Mustaches also ensue. So, Anchorman: The Legend of Ron Burgundy is, clearly, “Kind of a big deal.” That was one of the more quotable jokes from the movie, and the most obvious reference for this review. Indeed, that first film is chocked full of funny one-liners and creative gags, such as the jazz flute and the news battle. 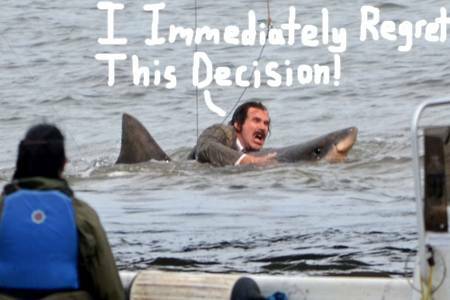 Despite the fact that they had nine years to develop a sequel, the funniest parts of Anchorman remain the funniest parts of Anchorman 2. Now, I laughed a considerable amount throughout, but for the most part the best jokes were callbacks to the first movie. True, I don’t believe anyone ever says, “I’m kind of a big deal,” which surprised me, but the jazz flute makes a brief appearance and there is a battle sequence. Ferrell and team seem to lack a clear understanding of why those things were so funny in the first film, though. I’m not just talking about being funny. I’m talking about being so funny as to be memorable. Let us address the battle of the news teams from the first film. This is humorous because it begins from a reasonable starting point, a rivalry with which we are familiar, and escalates it to an extreme, preparation for gang-style physical violence. Then there’s the unexpected twist of other news teams/gangs arriving to join the fight, plus the added comedy bonus of celebrity cameos. Violence ensues, and it’s all pretty funny to watch, but the thing that makes it so incredibly funny is the follow-up scene, serving as the punch-line, in which Ron, Brian, Brick, and Champ sit around Ron’s office, all a bit roughed up, and discuss what just happened, and we get the truly timeless cut straight from battle to Ron in his office saying, “Well, that escalated quickly.” As I mentioned, there is a battle in Anchorman 2. It’s even more over-the-top and has even less expected celebrity cameos, but for some strange reason, it lacks its punch-line. They recycled everything except the funniest moment. Although, yes, some very unexpected celebrity cameos. There are a few original moments in the film that are quite funny, though. There’s one extended sequence right in the middle in which Ron goes blind and secludes himself in a lighthouse. While in this lighthouse, Ron spends some time wallowing and failing to perform basic tasks; he overcomes his self-pity and learns to cope; he even adopts and raises a baby shark from the sea, an awesome subplot that culminates in Ron releasing his friend, who he’s named “Doby,” and singing a song about it. These scenes are really what the rest of the movie should have been like. They fit tonally with what Anchorman was trying to do, but it’s all original material. I sort of felt throughout like Anchorman 2 couldn’t make up its mind as to whether or not it should really exist. It wanted to be its own movie, but was also very afraid of letting go of its predecessor, which came out in 2004. Now, it’s fine and healthy for a sequel to maintain a degree of contact with its predecessor, but you don’t want to depend on that lifeline. 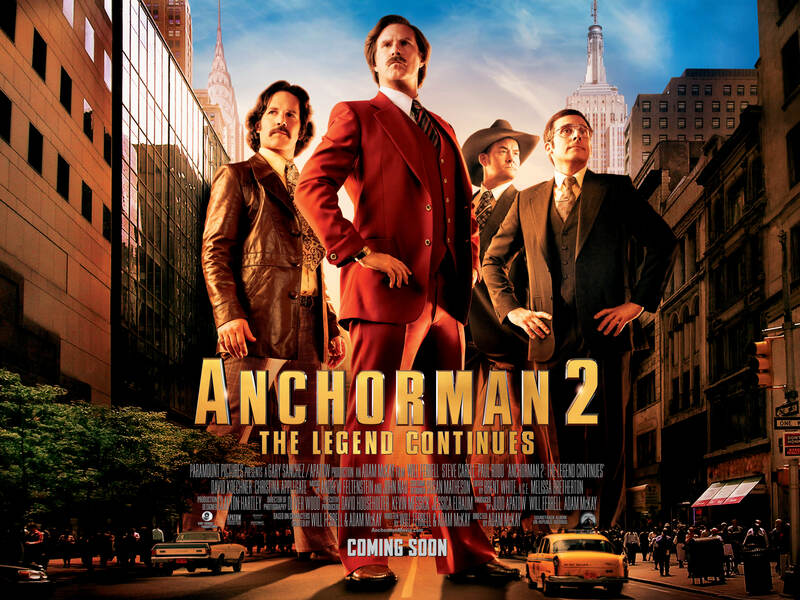 Anchorman 2 is just really clingy, and it suffers because of it. I work in a nursery providing childcare for babies and toddlers between the ages of zero and four, and I can tell you, the clingy ones are NO fun. Parents, abandon your children. Anchorman, let Anchorman 2 go. Don’t! It was the best decision you made all movie. 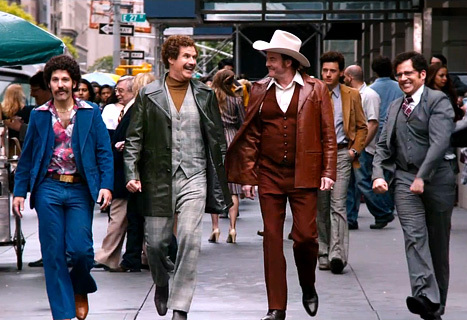 Now, Anchorman 2 is a pretty funny movie. As I said, I laughed quite a bit, but one consistent problem for sequels is comparison to the first movie, which Anchorman 2 invites and encourages, somewhat foolishly. It succeeds in reminding us how funny the first movie is, and that’s detrimental to its success. With all the hype and advertising, I anticipate a lot of really disappointed fans. Maybe I’m getting too snubbish, but I thought this movie was painfully unfunny. I don’t think it get a single genuine laugh out of me, except for some snickers at the cameos and maybe one good one out of The Ghost of Stonewall Jackson. Okay, Ghost of Stonewall Jackson DEFINITELY got one or two, but that’s really all I can think of. Seriously, what a lazy script, not to mention a criminal underutilization of Paul Rudd. Hi, past Alex! Maybe it was the beer. Maybe it was the Chinese food. Maybe it was the wine. Maybe it was the fact that I’ve only seen the (far superior) original once, but I laughed a ton. And yes, Stonewall Jackson was by the best part of that battle scene. That having been said, the dinner scene was just painful and Paul Rudd probably should have gotten Brick’s romantic subplot.